The driveway concrete was finally poured today. Most of the driveway is going to be grasspave but there are two central concrete strips to handle the majority of the traffic going in and out. The pattern dimensions match the cement board siding sizes. The pattern is running bond (joints at the center of the adjacent block) instead of the offset pattern of the cement board so it looks similar but not like it is trying to duplicate the siding. It took eight guys all day to place and trowel finish the concrete. Picture 3: Retarder. To give the concrete a sandblasted texture a retarder was sprayed on after the concrete was troweled. The retarder inhibits the chemical bonding of the cement on the surface of the concrete. After a couple hours it is washed off and takes the top 1/16" of cement with it. The retarder is the the white layer in the background of this photo. Picture 4: Final Pavers. This is the final product about 8 hours after it was poured. The retarder has been washed off to expose the aggregate. Besides giving the concrete a more natural look this also eliminates the squeal of turning tires like you hear in parking garages. The next step is to place the base which the grasspave sits on and then start with the grasspave. The blog entries are slowing down because the day to day construction events are all repeats of what has already been done on the model homes. At this point we're just trying our hardest to get phase 1 done and there isn't much unique news to report on. Tomorrow the driveway paving begins so there will be some grasscrete updates over the next two weeks. Also the solar panels will be installed soon. ROCK ROW FEATURED IN L.A. TIMES! The bulldozer that was supposed to come on Saturday was in the shop so the driveway grading has been delayed until Wed. In the meantime the grasspave was delivered; 20 pallets of plastic eggcrates for $20,000! Seems expensive but if you think about how much nicer the project is going to look than it would have with a solid concrete driveway then it is a good value. Driveway grading is beginning today. One huge downside to the porous paving we're using for the driveway is that it has perked the fire departments interest. When we were passing the project through plan check the fire department took a long hard look at the system we were using and made us promise what material we would use, how to install it, etc. So now they send an inspector out every couple weeks to see how the driveway is progressing because they are using Rock Row as a case study for other permeable driveways. 20 pallets of the grasspave system are being delivered on Monday so pictures will post then. So I was finally assigned the addresses for the project. They are 4774 - 4799 Rock Row Drive. They start in the 4700s based on the city grid, but why 25 addresses for a 15 home project? Because the guy that assigns addresses at the city is obsessed with numerology (what better job for an obsessive numerologist than assigning addresses). He sums each address and if the number is not in accord with his beliefs he wouldn't let us use it. So the project numbers skip in several places. For example we have 4774, 4776, 4778, 4780 and then it skips to 4786. Apparently 21 (the sum of 4 + 7 + 8+ 2) is cursed. So far we've spent about 3.5 million on the project. It averages out to about $7,000 per day. Now that Phase 1 and Phase 2 are underway there are usually about 30 laborers on site each day. Phase 1: The exterior is about 95% complete. Lots 2+8 will have flooring installed next week. Phase 2: The framing is 100% complete on the 2 story homes and about 75% on the 3 stories. If we need something ASAP and don't have a previously established contact, the last resort is to thumb through the Blue Book (like the Yellow Pages but only for construction) and call 3 or 4 companies to get proposals. After chhosing the best company, when the material is delivered see what company is on the side of the truck, or ask the driver where he is coming from, or who he usually delivers for, and call that company directly the next time. I know it is amazingly simple but it is also amazingly effective at cutting out the middle man. Its like buying plants directly from Monrovia Nursery instead of Home Depot. Last week we saved about 50%, or $900, on a simple gravel order using this technique. In light of L.A. city's new water regulations (restricting irrigation to only water on Monday and Thursday after 4), I thought I'd show an example of the irrigation needs between sod and drought tolerant landscaping at Rock Row. 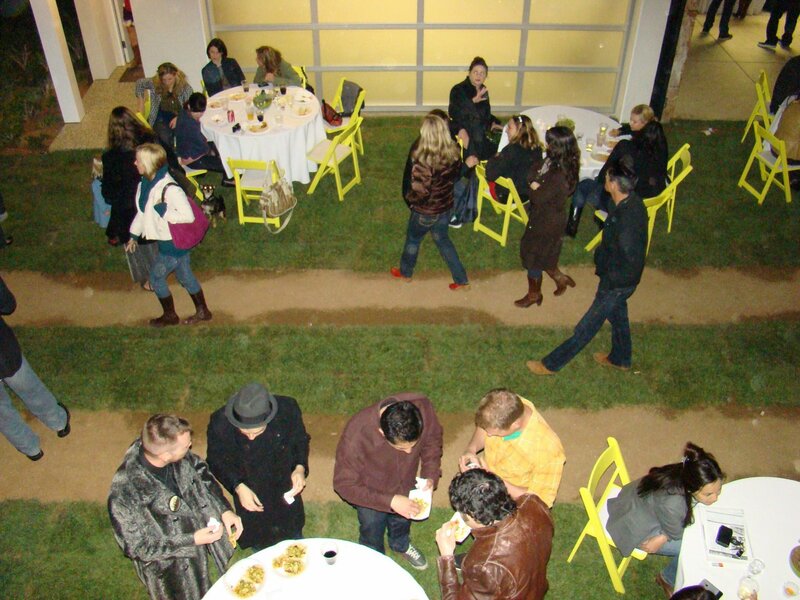 Let me first explain that the sod in the picture was only temporary for the opening party in March (our LEED rater freaked when she saw the grass at the party since sod is obviously a big no no for LEED). The permanent grass we're going to use for the grasspave driveway is a special drought tolerant fescue blend that only comes in seed so it wouldn't grow fast enough for the party. After the party we have only watered the sod as much as the permanent drought tolerant landscaping. The picture below shows how each plant has survived over the last two months. The drought tolerant planting has thrived with water about every three weeks while the sod is 95% dead. About 1/3" of national water use, about 7.8 billion gallons annually, goes to outdoor irrigation. Four days ago we put an ad on Architect looking to hire an intern. We're looking for a low level person to run through quality control checklists and help manage the subs now that 13 of the homes are under construction. It isn't a glamorous job but it is good experience for a college student. Within 4 days there have been 105 responses! Most of them are completely overqualified- some are licensed architects, some have over 10 years work experience, and many have their master's degrees. It is a sad testament to how much talent is sitting on the sidelines right now and how hard the architecture industry has been hit by the recession. One of our past projects got some love from the L.A. Times over the weekend. Two homes we completed in 2006, Jack + Jill, were the homes of the week. The AC units were placed today for the first 8 homes. The units are incredibly energy efficient with a SEER rating of 14 and use Puron. First they put down a layer of visqueen which is covered with 4" of sand. The concrete subcontractor had 10 guys out here and it took them 3 days to go do all this. 1. Concret trucks arrive carrying 10 yards of concrete each. Each home's footings get about 2 trucks. 3. The pump forces the concrete into a 4" hose that is managable to move around and reach to the far corners of the project. In just over a month we are sold out! 2. A somewhat unexpected result is that all the buyers are people we'd like to have as neighbors: A school teacher, a graphic designer, an architect, one that prints stationary... a lot of creative professional types. 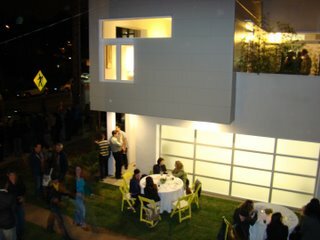 The design and product type really shaped the community residents as much as the built environment. Just as you'd expect to see a Prius in the garage more than a Hummer, these buyers fit in in the same fashion. After another busy open house weekend there is only one home left that is not in escrow: Lot 8, a Plan D. It was nearly in escrow, to the point that we weren't accepting contracts, when the buyer backed out.? Lot 3, Plan A is not officially in escrow at this point but there are several qualified buyers lined up for it so it will be gone in the next day or so. Phase 2 foundations are laid out and excavated. The second phase should be much faster with the subs since one of each of the plans was built for Phase 1 so all the dimensions can be taken from the full scale mock-ups we have a few feet away. Last week we reached 9 contracts in escrow. For Phase 1 there is only a Plan A and a Plan D left for July move in. The open house was busy yesterday since it was the first one after going on the MLS so there should be another couple contracts coming in this week. Also the camera broke so pictures of the Phase 2 excavation will have to wait until later this week. So yesterday I'm down at the city processing a couple final clearances to get the tract map recorded. I'm at B permits, a department that is notoriously bureaucratic, looking for a clearance for the removal of any existing street trees. The great thing is that there were no street trees so this should be painless.? First he tells me there is a street tree that will cost $1500 to remove. I show him a picture of the site when I bought it with no trees. He shows me a CAD drawing with a tree on it and says clearly there was one. OK so assume there's a tree there and I've never seen it and I pay $1500 to remove the imaginary tree and plant another one somewhere then am I cleared? He asks if I've gotten a $39,000 bond for the construction of a street light. He was surprised when I answered yes. I told him I would love to know how this is related to removing imaginary trees and he says, "Welcome to B permits." I jump through a couple more hoops and we're actually moving forward when he starts to print ?a file and the printer runs out of paper. This is where it gets interesting. Instead of getting more paper he actually tells me to come back the next day! WTF! I've been talking to this guy for an hour at this point and he can't get more paper. Then he actually tells me that's why he loves working at the city: no responsibility! I'm looking for Steve Carell at this point because the only other place I've witnessed this level of incompetency is on The Office. Luckily a fellow employee who has a minimal level of competency tries to print a couple minutes later, realizes there's no paper and goes and gets some. With the printer now working he gives me a form to take to another department that says I have been authorized by B permits to remove the tree. There is no tree. Sales update: After being on the market less than two weeks there are five homes in escrow and another three serious buyers. In conversation with the framing subcontractor he asked how sales were going. I responded that we were off to a very good start and he said: "Wow, that is very good news, but I'm not surprised because when you put your heart into a building it takes it and it shows." I ran to the bathroom so the workers wouldn't see me shed a tear in public. The drywall arrived for the remaining six. Each sheet weighs 70 lbs, so this is over 25000 lbs. of drywall or 4200 lbs per house. A typical car weighs around 2800 lbs. With the models complete (aside from some touch ups) we are setting our sights on the next six homes of phase one. The drywall is getting stocked today. Saturday's opening party was a smash! 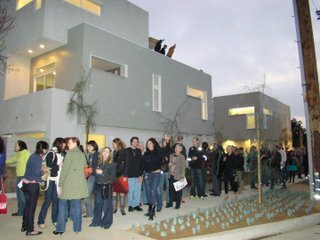 Over three hundred people came to see the model homes and the feedback was great. The landscaping is being installed. Dustin Gimbel of Second Nature Garden Design hooked us up with a great design. 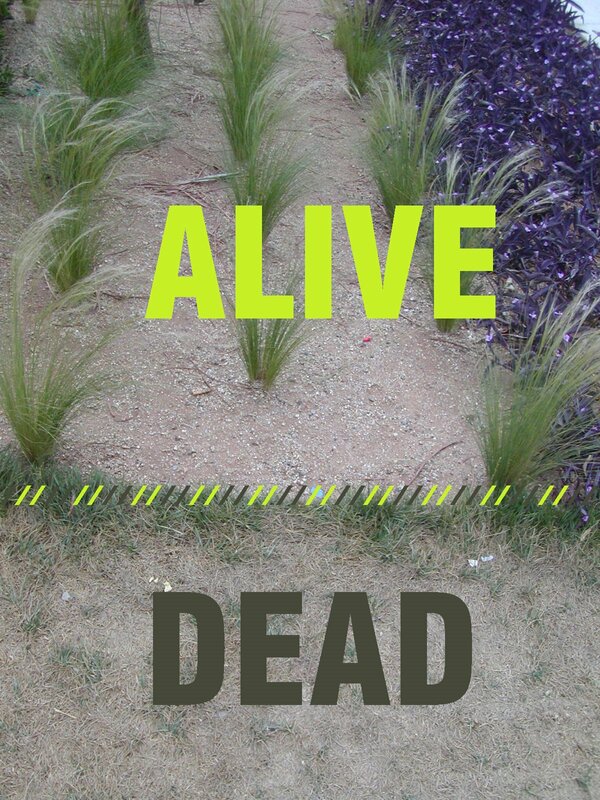 It is all drought tolerant since Los Angeles is the desert and LEED gives a few points for good landscape and irrigation (having a timer, rain sensor, multiple zones, good sprinkler heads, etc) since many homes use 50% of their water on their yards. We're offering free appliances to buyers who sign a contract before April 15. Went with the Bosch package which looks nice and is actually made in Korea. The appliances were delivered today and now we have to go back and fill in the cabinets around them. We get a couple LEED points for having efficient appliances. These are literally off the chart (see image). 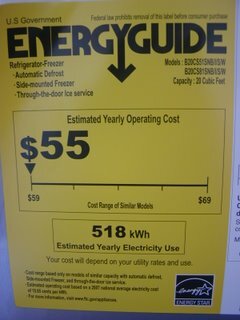 I think its 1/2 point for dishwashers that use less than 6 gallons per cycle, 1/2 point for energy star fridge, and a point for efficient washer/dryer. Also now that the interiors are coming together some of the architectural moments are showing through (the drywall mud is still visible on the wall because only the primer is on so far). The big bookshelf is now installed Along the open stair. It still has to be whitewashed and finished. It is made of FSC certified maple plywood that uses a soy based glue so there are no VOCs. The shelves align with every other step of the staircase behind. Also installed are the frameless shower doors and mirrors. The bathrooms are now 99% done awaiting only cabinet handles and finish electrical. Since we started construction last summer we average about $30,000 a week on construction. Over the last two weeks we've spent $65,000 per week. Regarding the finishes: Flooring is nearly complete with only the stairs left to finish. In the background is a large built in bookshelf that will be installed in front of the open staircase. 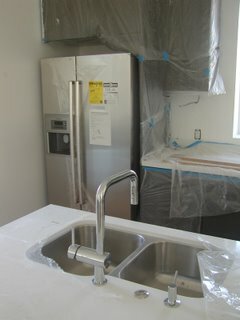 The finish plumbing fixtures are also being installed. The finish plumber said "we definitely didn't skimp on the fixtures" he also said he works alone "because he hates everyone" so I'm not sure how much you can trust his judgement. Update: He added that the fixtures belong in "$1.5 million dollar houses" and we are "throwing profit away". Finally the flooring is going in! It is strand woven bamboo which is about twice as hard as normal bamboo. The flooring is glued down to the concrete using a glue/sealer combination that itself cost about $1/ sq. ft. The STAUF glue is also eligible for LEED points due to its low VOC content. Today the fencing started going up. It is a product called Smartside. It is basically exterior grade OSB (50 yr. warranty) that comes with one smooth side that is pre-primed. It gives a very nice and clean line to extend the language of the building.